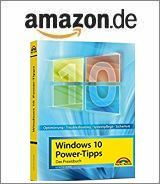 [German]Some users of Windows 10 are running into trouble with Windows Update, after upgrading to Windows 10 Version 1607 (Anniversary Update). Windows Update returns an error code 0x80D05001. I’ve addressed this error within my blog post Windows 10: Store downloads causes error 0x80D05001, but it was related to Windows 10 store. Nevertheless, this article can deliver a clue, what’s wrong with the system. Error code 0x80D05001 stands for DO_E_HTTP_BLOCKSIZE_MISMATCH. Third party tools, that establish an own proxy server, are the root cause for this error 0x80D05001. So check whether third party Internet Security Suites or VPN software is installed. If that’s true, one repair attempt (obtained from the linked blog post above) is to check the settings for the proxy server used in Windows. Here are the steps. The steps to reset the proxy settings in Internet Explorer is also discussed inKB2289942. If your application requires a proxy server, read KB3175743, and set the proxy rules according to the requirements defined in the KB article. Recently I stumbled uppon this Technet forum thread, where the same error code 0x80D05001 has been mentioned together with Windows Update. The user reports that the error occurs after upgrading some Windows 10 clients from version 1511 to version 1607 (Anniversary Update). since upgrading to Windows 10 version 1607 updating our clients fails with error code 80d05001. I could narrow it down to our firewall that does http and https inspection. That seems quite weird as it was working properly with version 1511. According to the logs the issue may be caused by update delivery via file streaming. It seems Windows 10 does not use standard conform MIME-types for downloading since version 1607. Afterward Windows Update was able to pull updates under Windows 10 Anniversary Update. I found also this MS Answers forum thread with a similar case. They are using a SonicWall firewall apliance, and a Windows Defender definition update error 0x80D05001 occurs on clients. Within the thread is a reference to KB3175743, where Microsoft details the Proxy requirements for Windows Update for Windows 10 Anniversary Update. This entry was posted in Update, Windows and tagged error 0x80D05001, Problem, Update, Windows 10 Anniversary Update. Bookmark the permalink. The box is already unchecked. Still it is showing the error. Samsung UPC Horizon Box (Europe) is also causing this behavior – and I guess other software too.